Sometimes life is such that writing is just another thing to do. It's on the list, but I've been avoiding the list, which in turn means I've been avoiding writing. My list of ideas is growing, but instead I've taken to trails with a few friends in the past week, had some lunch playdates, and enjoyed the face to face company with those that I care about. There's lots of buzzing going on in our house, some pinata making, a birthday cake to bake, and a house full of girls on the horizon to celebrate. So I'm in it, up to my chin, enjoying the full swing of life these days. Happy Weekend, enjoy whatever it is that makes your heart smile. Last night I put some spaghetti sauce in a pot, added some corn, some chili spices, and a can of organic chili beans. I served the chili over pasta and dinner was ready in a flash. My oldest ate 2 bowls of the chili and requested it for lunch as well today. 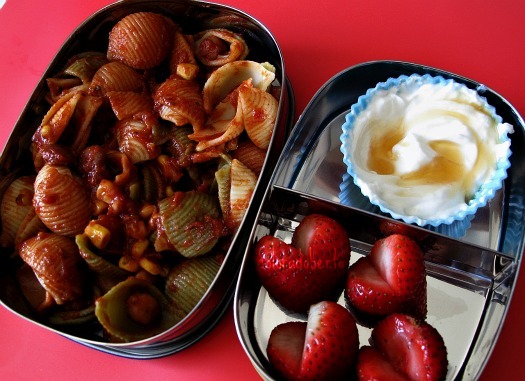 This morning, I packed a hardy lunch for her, my growing girl. Consumers today naively believe that we are being protected by our Government when it comes to food safety and how our food is produced. Unfortunately I feel much differently as a consumer. I know it's my job to learn where the food I purchase comes from, which sometimes means directly contacting a company or doing a little research on brands I want to support. When I walk into the grocery store, I'm very conscious of the fact that where my money is spent helps shape the future purchasing decisions of that retail establishment. To me, every dollar counts. While this post could easily take a turn for the worse, showcasing the major injustices of our meat industry and CAFOS (centralized/confined animal feeding operations), I'm going to focus on the positive. My husband and I were vegetarians for over a decade. At this point an omnivore diet serves our bodies better. I believe with a vegetarian driven past, we have consciously decided to only consume humanely raised meat. I find it funny, but rather fitting to my personality, that after four years of blogging I finally attended my first Blogging Conference. This weekend Denver hosted a one day conference called Bloggy Boot Camp. I didn't actually purchase a ticket for the conference when they went on sale in the Spring because I kind of wrote myself off as one of those "don't attend conferences" bloggers. In a random turn of events, one of my dearest blogging turned in real life friends texted me and offered me her ticket. I graciously accepted. Now I may go as far to say, I may be forever indebted to her for giving me this opportunity. It's been a fabulous weekend, to top it off J and I went on an awesome hiking date this morning. One part of the trail dead ends right into a huge slab rock face of the Rocky Mountains. It's beautiful and I felt compelled to just give it a hug. The idea for this vlog was born out of that simple moment. I feel like some things need to be said about this vlog. I was wearing a hat (but had to take it off because of the shadows on my face), I was sweaty, I didn't exactly anticipate shooting a video to share publicly. But you know what? All those excuses didn't matter, I just wanted to enjoy the moment. I am who I am and I am embracing it, that feels damn good. Oh those darling mini bananas, they seem to call out my name as I pass by the banana section of the produce department. By the way, look at how cute it is in the bento. Bento aesthetics 101, buy the cute bananas. Organic WW bread, Applegate Farms Ham, and vintage cheddar sandie, Cute chocolate mushrooms/cookies from Japan, Fresh peach, Pirate's Booty, Mini banana, carrot flowers. My husband purchased these bags for the girls, I've taken them over as lunch bags, depending on the bento I packed that day. This one features Quatchi, he was a Vancouver Winter Olympics Mascot. Yes, same foods, different day!?! You'll definitely see overlap here, although I can't complain that I am giving more nori, berries, or broccoli to my daughter. She loves them, so I just go with it! Today I packed our LunchBots, I love the size, I go wet foods with one and dry with the other, that way there is no chance for foods to get soggy. 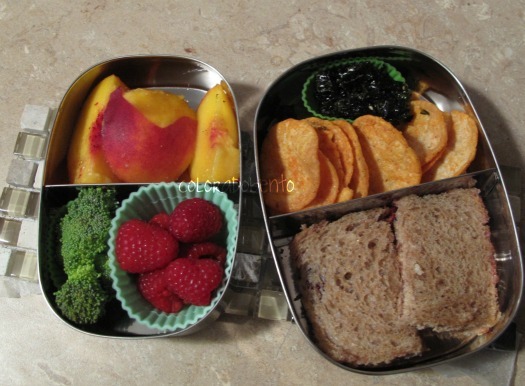 Nectarine, raspberries, broccoli PB&J on WW bread, bbq pop chips, and Nori snacks. This week ends my husband's two week business trip. I miss him and his help in the morning. 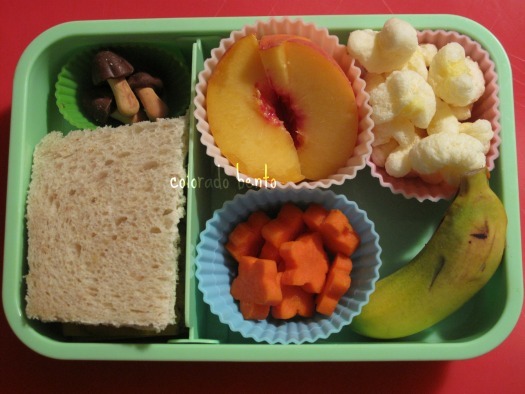 I desperately wanted my daughter to get hot lunch this morning, but she asked for a bento. I obliged. It was a quickie. We received a package of goodies from Japan that my husband picked up in Los Angeles. 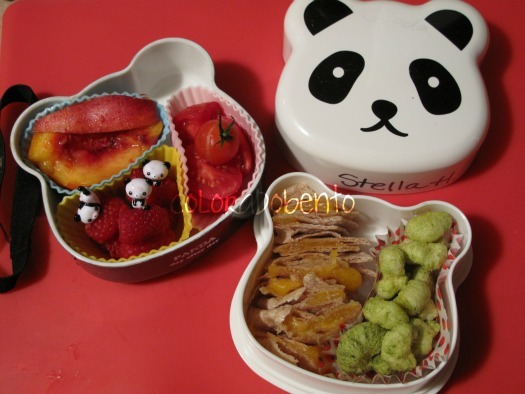 Inside were the panda picks, so my daughter requested her panda bento as well today. Panda x 4. Nectarine, raspberries, from our garden tomatoes, Organic WW tortilla and sharp cheddar quesadilla, veggie Pirate's Booty. As of Saturday afternoon, the kitchen project has been completed! Our home was built in 1962, the people we purchased the home from lived in the house for 19 years. Let's just say, they were comfortable in the home. There were a handful of updates in the house, but the kitchen was seriously in need of some freshening up. Our last home was built in 1959, but had a completely redone kitchen. I can tell you, I've missed my old kitchen a lot. Our goal is to do a major tear out of the kitchen within two years, which also means some walls coming down. The kitchen will have to be totally gutted. In the mean time, we've decided to make a small investment in updating what we saw as crucial needs in the kitchen. 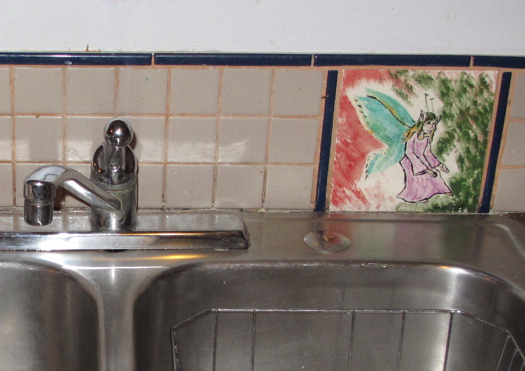 For now, we've torn out the old backsplash, countertop, and sink. all eyes on America, strong, brave, dreamers, we became one, all scarred by a deep crack that was unwarranted. America, the world's beacon of freedom, which affords me uncensored opportunity to share whatever it is I need to say, every year we move forward, we may look deeper into our neighbor's eyes or more suspiciously. America, the place where I always teeter in the reality of before and after, but a place where my girls know no differently, I can't quite comprehend a global win vs. lose, but I do know loss. America, I'll always be a Yankee, no matter how many years I call Colorado my home, Oceans, mountains, prairies, cities, farms, desert, south, north, west, east, The best place on earth, I'm proud to be an American. Our kitchen project is completed, you can see the photos at Eat Play Love. My daughter loves when she gets something unexpected in her lunch. Today it was a Organic Whole Wheat hot dog bun for the bread of her sandwich and lunch meat rolled up, instead of a hot dog. I'm not quite sure how the mustard looked when she opened it. Another surprise, Nori Snacks! I can't keep them in the house, the girls love them. 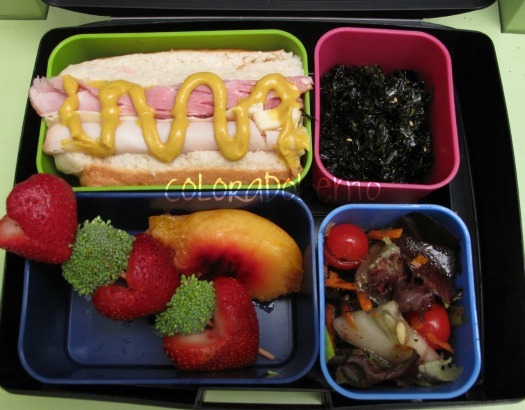 Applegate Turkey and Ham, Sharp Cheddar, Rudi's Organic Bun, Annie Chung's nori snacks, Strawberries, broccoli skewers, Colorado peach, Left over salad, greens, carrots, cukes, and tomatoes. Kitchen Construction Phase 1, The Demo! My parents are in town visiting and we always seem to have some house project to do when my dad is here. I like to take advantage of his 50 years of carpentry experience. So together we are in the throws of replacing a countertop, adding a new backsplash, and installing a new sink with faucet. The photo is what my kitchen looked like this morning. I am happy to report, I do have a new countertop in and I am just waiting on a few pipes to be connected under the sink. This is what my kitchen currently looks like, so I didn't pack lunch today. I won't be packing it tomorrow either. Thank goodness our school district has an incredible lunch program. I guess I'm using the temporary construction as an excuse, as I don't need to actually cook lunch to pack it. I'm helping with the remodel, so it's just one more thing to do. Breakfast has been enough of a challenge without water in the kitchen! While it's bittersweet that this moment happened when J was out of town, THIS MOMENT HAPPENED. It was exhilarating and such a proud moment for me. It definitely rivaled the feelings I felt when she took her first steps. My GL spent the entire day practicing on the sidewalk, all by herself. I'd help occasionally, but she'd send me off so she could keep going at it. I took her to the baseball diamond and this is the first moment when she just took off. 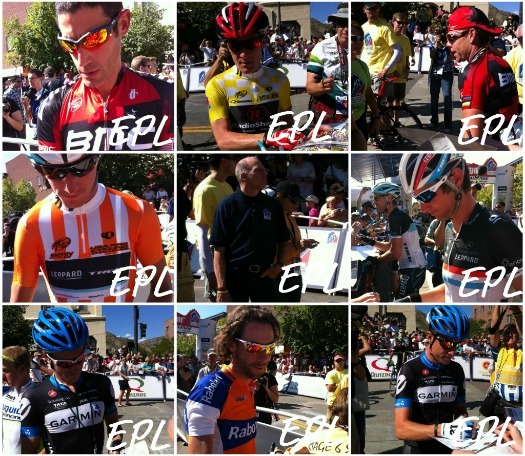 Let's face it, Colorado is the perfect place to host an annual stage race. It's been 23 years since Colorado hosted the Coors Classic, a race that once put our state on the map in the cycling world. No one could argue, thanks to Lance Armstrong and the impact he's had on the boom of cycling in the States, Colorado is once again home to an awesome bicycle race. The name on the other hand, could use some fine tuning. I suppose it's better than the Quizno's Pro Challenge, but still USA Pro Cycling Challenge is too wordy for a bike race. One of the downfalls with a name that's willy nilly is the impact on social media, there wasn't one fine tuned hashtag aka # on Twitter, people used #USAPCC, #USPCC, #USAP, #PCC, and #USAProCyclingChallenge (I always love a 20 plus character hashtag). Boo! I had to use multiple hashtags or click through various ones to see what was being adopted. 200 Hikes Day Unknown: How About Those Hikes? The questions began about a month ago. So Denise, how are those hikes coming along, are you going to hit your goal? In January I set a goal to hike 200 times this year, I figured 3.846 times a week was possible. I probably over guesstimated my hiking ability versus my free time to hit the trail. I should've been a little more conservative with my first year goals, more like 100, on average twice a week. Now that number is digestible.